Guam and Palau are new additions to my wish list, it wasn't until there was this article in the SMH covering the two Islands that my interest really grew. 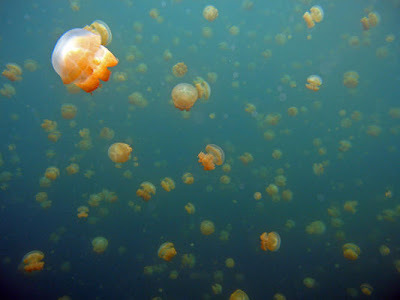 Palau is famous for the lake in which you can swim with the jellyfish at Jellyfish Lake. The jellyfish have lost their sting due to the lake being fresh water, not seawater. Palau is home to only about 20,000 people and consists of 300 Islands (only around 9 are inhabited). Guam on the other hand is a US territory (and you generally have to fly through Guam to get to Palau), and a site teeming in WWII history. As you'll know from my previous posts I'm a big fan of food when travelling (well in general really) and the food in Guam is meant to be fantastic. Water sports are also popular, with the average water temperature being 27C all year around! That was very interesting about the jellyfish as I'm generally quite scared of them. I too would love to visit some WWII related sites in the South Pacific as I had relatives who fought there. Yes living in Australia you tend to try and avoid those nasty Jelly Fish so this is definitely an interesting concept!